Jake picked up his third national title in Bridlington on Saturday, becoming the NABGC 60kg class A champion with victory over Jude Moore from Downend ABC in Bristol. 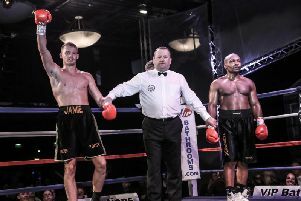 The England international and southern champion pushed Jake all the way in a highly competitive final, but the Blackpool fighter’s skills and determination won the day. Jake had boxed in every round to reach the final, seeing off six opponents. Having defeated north-west rivals Aaron Maddox and Kieron McDaid, Jake overcame Merseyside and Cheshire champion Tom Wilburn, North-East champion Beau Smith and Midlands champion Amar Ali to reach the final. At the age of only 15, Jake is on course to become the most decorated amateur the resort has yet produced, having lost only three of his 49 bouts. And Jake’s boxing year isn’t over yet: he flies out to Lisbon, Portugal, next week to compete in the Odivelas Box Cup. Other boxers from the Bagot Street club have been competing admirably around the country. Frank Varey had his third outing in an England vest, representing his country at the Welsh Institute of Sport in Cardiff, where he beat John Murphy on points. Heavyweight Luis Wright narrowly missed out on the National Development final, losing a very close bout to Mark Gavin of Bletchley ABC in Milton Keynes. Three other Sharpstyle fighters won their latest bout on points: Thomas Varey (against Callum Drinkhald of Sunderland), Alice Pumphrey (Luisa Tunstall, St Helens) and Nelson Birchall (Dylan Murphy, Birmingham). 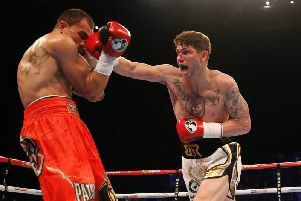 Levi Barnes lost on points to Shane Patterson (Newcastle).